He is a one-time slugger award winner and a two-time All-Star award winner; he may not currently be the biggest name in the MLB yet, but he is surely carving out a nitch for himself in the league and with his impressive statistic over the course of his career, he will get there soon. The star being referred to here is none other than US professional baseball outfielder and designated hitter, J D Martinez, who currently plays for the Boston Red Sox. Martinez began his professional career in 2009 with Houston Astros and has also played for other MLB teams like the Arizona Diamondbacks and the Detroit Tigers. He is an excellent right-handed thrower and batter, who knows his onus when it comes to hitting the ball; a skill he has improved himself on with each passing. Learn more about him below. 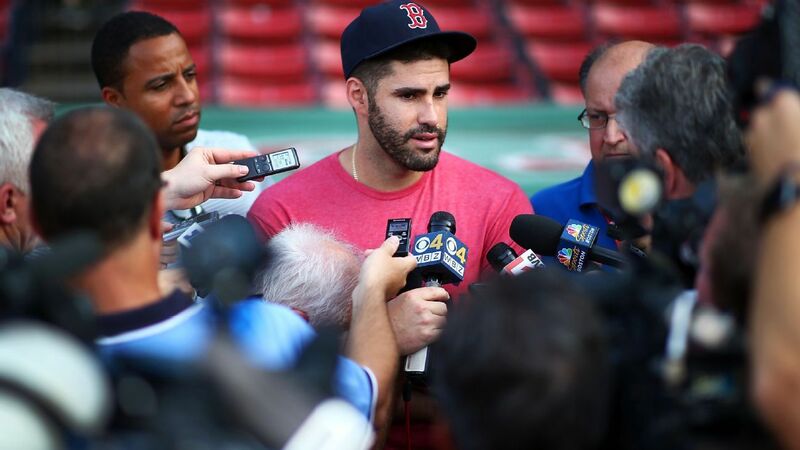 J D Martinez was born as Julio Daniel Martinez on the 21st of August, 1987 in the city of Miami, Florida. He is of Cuban descent and the youngest of his parents’ six children as well as the only boy. Growing up, Martinez got all the attention in the house as the only son and the youngest in the family. He started playing ball at the tender age of four; first, it was basketball and then the baseball. His father always took him to watch baseball games during the weekends and watching players hit the ball really did fascinate him and he made up his mind to hit the ball some day. To ensure he doesn’t get involved with the vices the neighborhood, his father encouraged him to play baseball. He soon had a mentor, Paul Casanova who tutored and guided him on rules of the game of baseball. Most times after school, Martinez spent the rest of his day at Paul’s home playing baseball. His mom sometimes got worried about his obsession with baseball but today, that “obsession” has paid off. At Flanagan high school, Florida Martinez played for his school’s baseball team. After graduating from high school in 2006, he was selected by the Minnesota Twins, at the 2006 Major League Baseball draft but he turned down the offer and proceeded to Nova Southwestern University where he played for the Sharks, during his stint with the Sharks. During his college career, he won the All-Sunshine State Conference baseball player title twice. J D Martinez kicked off his professional career with the Greenville Astros of the Rookie-level Appalachian League after being selected by the Houston Astro in the 20th round of the 2009 Major league baseball draft, by this, he became the first player to be drafted in the MLB from Nova Southwestern University. That season, he batted .403 at the Appalachian league before being promoted to the Tri-City ValleyCats of the Class A-Short Season New York–Penn League. The following season (2010), he began with the Lexington Legends of the Class A South Atlantic League (SAL) where he recorded on-base percentage of (.433), slugging percentage of (.598) and batting (.362). Before the mid-season, he was promoted to Corpus Christi Hooks of the Class AA Texas League. At the end of the season, he was named Houston Astros’ Minor league player of the year, as well as the South Atlantic League MVP. He remained with the Astros till the end of the 2013 season, in March 2014, J D Martinez signed a minor league contract with the Detroit Tigers. After playing seventeen games for the Triple-A Toledo Mud Hens and recording ten home runs and driving in twenty-two runs, the Tigers purchased his contract, called him up to play for the team. By June, he won the American League (AL), Player of the Week Award. He ended the season with thirty doubles, twenty-three home runs, seventy-six RBIs, .912 OPS, and .315 batting average. That year, Martinez was named a finalist for the Players Choice Award for AL Comeback Player of the Year. In 2015, he signed a one-year contract with the franchise worth $3 million. That season, he was named a reserve for the American League at the All-Star Game, won his first Silver Slugger Award, named a finalist for his first Gold Glove Award in right field and was ranked 2nd among AL right fielders, it was indeed a very fruitful year for the outfielder. He signed yet another deal to extend his stay in 2016. The contract was worth $18.5 million but injuries that season saw him traded to the Arizona Diamondbacks in exchange for Sergio Alcántara, Jose King and Dawel Lugo in 2017. In February 2018 he signed a five-year contract with Boston Red Sox worth $110 million and has remained with Red Sox till present. He ended his 2018 season with the team recording with forty-three home runs and a career-high of one hundred and thirty RBIs. With his latest deal with the Red Sox worth $110 million, J D Martinez’ s annual salary as of 2018 is $23.75 million. His net worth is currently estimated at $25 million. His personal investment is put at $12.5 million, and his house is said to be worth $1.3 million. J D Martinez is the only son of Julio and Mayra Martinez. He has five older sisters. The MLB outfielder is not married but has a stunning girlfriend named Ariana Aubert. Like J D, Aubert is a Miami native but of Colombian descent. Martinez and Ariana attended the same high school, though it is not certain if they started dating since high school. Ariana was a former Miami Dolphins Cheerleader, after cheerleading, she took up the role of Events and Entertainment coordinator for the same team. She loves traveling, skydiving and she is a fan of the popular TV series Walking Dead.